Sept. 27, 2018 - Inside the Munden Ventures office in Kamloops, B.C., there’s an attractive waiting room with Tim Horton’s coffee and tea, comfy chairs, Wi-Fi, a TV, and a restroom complete with shower. No, this isn’t a waiting room for the odd journalist visiting the office; it is for their drivers and the drivers of customers who have brought their truck or trailer in for maintenance or repair. Greg Munden owns Munden Ventures along with his wife, Kim. “Being in the trucking business ourselves, we know that most shops spend very little time considering the comfort of the professional drivers who are waiting for a repair to be made. We wanted to be different, and it definitely creates some buzz,” he explains. Originally called C. Munden Transport Ltd., the transportation services company began in 1967 as a log hauling operation and over the years branched out into third-party commercial vehicle maintenance, tank manufacturing, inspection and repair services. Last year Trucking HR Canada named Munden Ventures one of their 54 top fleet employers of 2017. According to the awards news release, companies were chosen based on ratings of recruitment and retention practices, workplace culture, compensation, training and skills development, and innovative HR practices. Running just 13 trucks and employing 13 professional drivers, their small size makes it in some ways easier, and in some ways more difficult, to make sure their drivers are happily employed, Munden says. Drivers are also kept happy with a continually refreshed fleet of trucks. The oldest at the moment is two years old. Munden runs exclusively Kenworth, all of which are the new model T880 with Cummins engines. The log haul trailers are mainly Peerless, which are manufactured in Penticton, B.C. 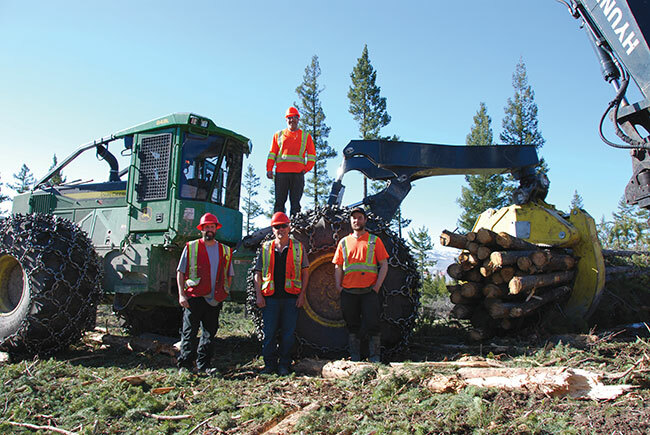 Eight years ago, Munden Ventures took on a steep learning curve by adding log harvesting to its portfolio. The new venture, called Peak Forestry Ltd., is overseen and co-owned by Munden’s brother, Chad. The move to harvesting was a difficult, but necessary decision for the company. In 2010, the height of the downturn, many forestry companies were struggling or closing up shop, which could have meant fewer jobs for Munden’s drivers. The company needed more control over the future and saw vertical integration as an opportunity. “Over the company’s lifespan, with my parents and grandparents before them, we were very dependant on one licensee or one contract. Many times that worked out well, but sometimes in our history that caused a lot of grief. One of my goals was to not be tied to a single sector of an industry or a single customer. The diversity has really helped us,” Munden says. The Mundens bought out a contractor they had been hauling logs for, which included about seven pieces of forestry equipment. The contracts at the time amounted to about 150,000 cubic metres. Peak Forestry now involves 14 employees and 11 pieces of iron for all phases save for the processing, which is subcontracted. This includes a growing road building operation with a dozer and three excavators. The team brings in about 200,000 cubic metres a year. The fleet comprises two John Deere 953M feller bunchers, two John Deere 848 skidders, one Hyundai HX3026 and one HX3030 log loader, a John Deere 850J dozer, and three excavators, a John Deere 2054, a John Deere 160 and a Hyundai 140. The subcontractor runs two processors — a Hitachi and a Caterpillar. “Pretty well everything we run is within two years old except one older excavator,” Chad says. “Uptime, productivity and operator satisfaction are really important to us. Running the newer equipment, and the right equipment for the job really helps with those goals. “Honestly, any success that we’ve had trying to figure out the harvesting business, and really all areas of our business, the credit has to go to our operators and staff. We think they are the best in the business!” Chad says. About 40 per cent of the company’s log hauling business is now dedicated to Peak Forestry, while the rest is divided between four other log hauling contracts with West Fraser, Interfor, Norbord and River City Fibre. The average haul distance is around 140 kilometres one-way. Having a mechanic service side of the business means costly machine repairs and downtime are less of a challenge. The forestry equipment and trucks are cycled regularly, typically running less than four years. Munden works closely with Inland Group, Brandt Tractor, the John Deere dealer in the region, and Woodland Equipment, which is the dealer for Hyundai. “We’re really relationship based. Pretty well everything we do is driven around history. For our business and our services, we count on loyalty and relationships and we try to show that to our suppliers. Having those relationships have paid off for us,” Greg Munden says. With Munden’s son, Nolan, a recent addition to the team after receiving his mechanic red-seal license, and father Jim milling about the shop every now and then in spite of his supposed-retirement 10 years ago, three generations of Mundens can be found on site any given day. 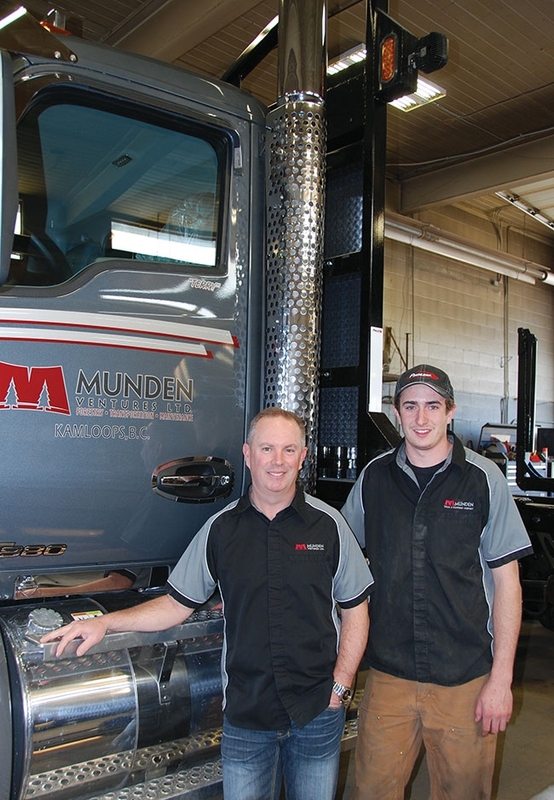 A priority for Munden, both as a hauling company owner and as a member of the trucking associations, is finding the next generation of drivers. Across Canada the trades struggle to recruit, but truck drivers in particular are in short supply. Munden can list several reasons for this, but it’s the solution he’s more concerned about. Much of his work with the association is focused on program development to mentor and train young people for professional driving positions. “We’ve done a really poor job of getting the word out that there are really great careers as a professional driver. Like every industry there are jobs and employers that are not good, but there are so many really good positions that factor in work-life balance and offer a really good wage to support a family. We need to do a much better job to get that word out and develop training programs,” he says. Munden also sits on a BC Forest Safety Council committee that has developed a training program for log hauling. The initiative is voluntary for licensees and truck companies, but should raise the minimum skills standard for drivers, Munden says. A stumbling block for drivers is that government does not recognize the job as a skilled position, and so drivers in training are ineligible for government funding or student loans. Munden says step one is to get the log hauler classification, and truck driving profession generally, changed to “skilled”, which will give prospective drivers access to training funds. According to the BC Forest Safety Council it can cost upwards of $20,000 to train a single log hauling driver. Those are costs that an individual can’t typically afford, and with their current margins, companies can’t either.